The Red Tailed hawk breeds in this area of Southern Ontario, as well as most of the rest of North America, and is one of the largest Buteos, weighs between 1.5 to 4 lbs and may have a wing-span of around 4.5 feet. As I travel around this area of Southern Ontario, I often see these majestic birds as they perch on fences and trees watching for their prey, and if I am lucky I will see them take off gracefully, catching a glimpse of their lovely brick-red tail feathers. The female is typically larger than the male and these birds are often called Chicken Hawks, although they seldom pray on chickens! Easily identified by their rusty-red tails which can be seen while the birds are perched or in flight, these birds can often be seen in this area as they hunt their prey or rest on telephone poles or fences. These birds are opportunistic feeders and their usual prey may include small mammals, fish, backyard birds , reptiles and rodents. Red Tailed hawks reach maturity at around 24 months and appear to form pair bonds which may last for several years, with the pair using the same territory annually. The nest is usually built in a large tree or on a cliff ledge and is made of twigs, corn cobs, and other plant material. 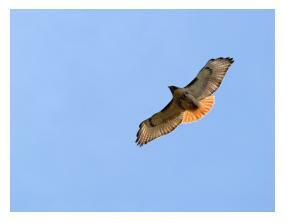 In this picture of a Red Tailed Hawk in flight, the bird's beautiful red tail-feathers can be clearly seen. Usually, between one and three eggs are laid each Spring by a pair of birds, which are incubated and then fed by the female, whilst the male brings her food for herself and the chicks. At around ten weeks of age the young are fully fledged and ready to leave the nest. These birds are legally protected in Canada, Mexico and the United States by the Migratory Bird Treaty Act. This site has lots of information about this, the most common and widespread hawk "le faucon" in North America, which is frequently seen sitting on utility poles where it watches for rodents in the grass along the roadside. The video below is supplied courtesy of YouTube and Berwick Productions, I hope you enjoy it as much as I did! Do you have a great story about a Red Tailed Hawk sighting? Share it! Big Adult Red Tailed Hawk.. Toronto? Red-Tailed Hawk going after our dogs? 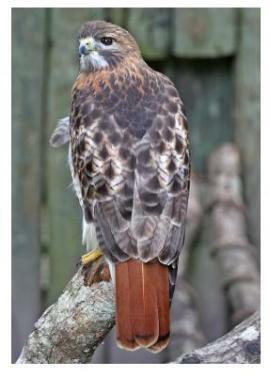 This Hawk appeared on my back fence a few minutes ago, east side of Oakville, Ontario. A Hawk looking for dinner on a cold day!